We invite you to check our additional free guides here. Two-shot injection molding; see the difference. You want to see what two-shot is capable of. You want to know what to look for when sourcing a supplier. That’s why we created this look book of two-shot molded parts. Just fill out the form below and we’ll send you a link to the book today! 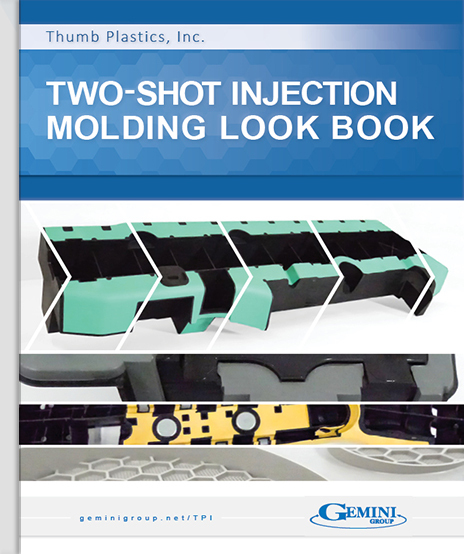 In a nutshell, two-shot injection molding is combines two plastic resins into one molded part. The process isn’t hard to understand, but it’s very difficult to master. It involves a high level of technical expertise and attention to detail. Learn the quality you should expect from a capable supplier and the complexity you can achieve when you choose two-shot injection molding for your plastic part. Download your look book today!